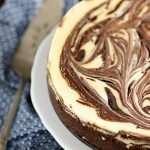 Satisfy your sweet tooth with this heavenly delicious Keto Chocolate Swirl Cheesecake. It's a delicious keto treat you can serve on special occasions. In a large bowl, whip egg whites until stiff but not dry. In another large bowl, beat cream cheese, sour cream, 1 cup Splenda, and flour substitute until smooth. Beat in egg yolks one at a time, blending well after each addition. Gently fold whipped egg whites into cream cheese mixture. Spoon batter into prepared crust. Slowly swirl 6 ounces of melted chocolate through cheese mixture to give a marbled effect. Place pan on a cookie sheet in the preheated oven, and bake 60 to 70 minutes or until set. Turn off oven, and allow cake to cool in the oven with the door open. When cool, transfer to the refrigerator, and chill overnight. Spread 3 ounces of melted chocolate on a cookie sheet. Sprinkle with remaining chopped nuts, and then refrigerate until chilled. Scrape chocolate from pan to form slivers. Decorate cake with chocolate slivers by heaping over the top, and pressing vertically onto the sides of the cake.